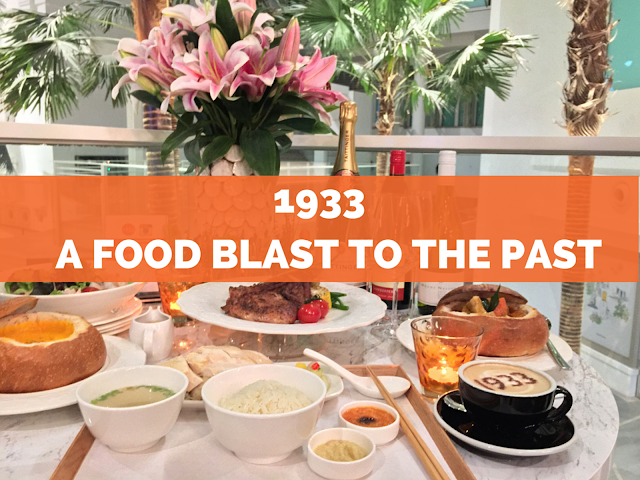 1933 at Capitol Piazza - A Food Blast to the Past! 1933 is probably the only F&B outlet capitalising on the retro concept of Capitol Piazza so far. Situated just beside the Capitol Theatres, the vintage decor of rattan chairs, Peranakan-motif tiled bar counter and the warm, tungsten lights illuminating the whole restaurant will draw you into this time portal, a place where you would experience a food blast to the past. Seriously though, they gotta start playing these kind of songs on their playlist because I believe music plays a huge part in the ambience. If songs like these are playing in the background, while you are dining with these food that are inspired by the Nanyang identity in that era.. wow. The whole experience will be magical. OH MY GOD. THIS IS SOOOO GOOD! Marrying Nanyang based coffee beans with an espresso style, what you get out of 1933 coffee is a robust, rich flavour that will leave a chocolaty aftertaste in your mouth. I must have had like.. 3 cups of these awesome mocha? IT'S THAT GOOD. Wowed again. This salad can really whet up your appetite for more food with its refreshing Thai-flavours. The blend of the greens, minced meat, seafood and tangy lime will make you go: "SAWADEEMORE!" A hint of orange zest, a dash of carrots, onions, cream, ginger and butter served in French bread bowl, this power carrot soup is smooth and light in taste without being too overpowering. The main highlight is their bread bowl though. Gardenia can offer them their tagline as well because their bread bowl is so good, you can really eat it on its own! With a #4point5evilbeans rating, this is a MUST-ORDER! Tender kampong chickens are immersed with aromatic and flavourful coconut-based curry and served in a bread bowl. I will always order bread with curry chicken when I see restaurants offering this on the menu, because it can be so comforting to just tear, dip, eat. And in my opinion, this is definitely one of the best curry chicken with bread in Singapore! ORDER IT! I am sure you would be familiar with this dish. At $16.80, the bar is set very high and will inevitably be compared to the $4 chicken rice you can get from normal hawker centres. The rice is fluffy and very fragrant, due to it being cooked in chicken broth instead of just the usual ginger and pandan leaves. However, the main character, falls flat with a bland, chicken taste even with the addition of their chilli sauce. I expected more out of this dish. Composed of succulent pork chop dipped in thyme, bay leaves, honey and brine served on a rack and accompanied by sauteed potato in olive oil, this Grilled Pork Loin is a delight! The skin was grilled to a slightly charred taste, which I loved, and the meat was juicy. The stars of this dish have to be the sauces that comes with it: a choice of Hainanese, black pepper and mushroom sauce. Definitely try the Hainanese and black pepper sauce - they are wonderful complements to the pork! The plating itself scores at least 2 evilbeans on its own. How can one resist not digging into this soft, moist and aromatic pandan flavoured cake when it's presented to you like this? The Gula Melaka is a genius addition to the cake, and the berries that accompanies the dessert is the perfect ending to your food and time warp to the past. MUST ORDER. The price might be a little on the high side, but that is a given as I am sure the rent at Capitol Piazza would not be cheap. Most of the food quality are well worth the price and the ambience makes for a relaxing evening at 1933. This will be a cafe that I will keep dropping by again and again. *Valid for dine in only, from 12:00 PM to 3:00 PM. *Valid for dine in only, from 3:00 PM to 6:00 PM. So, if you have a weekday free, just go there and sit from 12 PM to 6 PM and enjoy your lunch and desserts all at discounted price! Now go play that 夜上海 song again. I know you wanna.